as it says, im on a megga tight budget on this one. im looking at 300 quid INCLUDING the cost of the bike itself!! heres the story. my mate daves been a good pal to me over the years. and i know he has always wanted a brit bike to pootle round on, but his young family and limited budget can just about keep his gs1000 suzuki on the road. now, at the end of april he's 40, and so instead of the usual tie or some daft socks or a crate of beer. ive set myself the challenge of getting him a brit bike. this is where we stand. bike is more or less complete as we stand. a few infuriating bits missing, but all the big bits are there. i fancy a sort of pseudo trials/military style for it. thus its decided that it will be matt green and black, simple and cheap, and as he likes a lot of military stuff, it should go down well. i roughly assembled the bits ive got, and this is what we have so far. 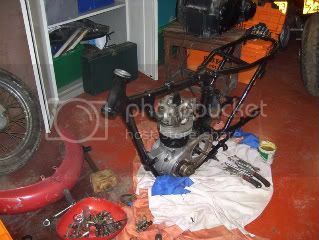 engine is all there more or less although being the distributor type its not original to the bike, tyres are goosed, ditto battery, tinware almost all complete, forks are average but salvagable, tank ok but missing a filler cap. exhaust is there but rusty, ditto rims and frame. seats ok, and theres a tatty but complete loom. so, weve spent 50 quid, add to this 45 quid for 2 new trials type knobblys, 30 quid inc p+p for a gasket set, and ive just ordered a crank nut, rear sprocket a set of headstock bearings etc from draganfly adding another 68 quid to the bill. chuck in 20 quid for the assorted paint ive got, and so far we are at Â£213, leaving me another Â£87 in the kitty to get it up and running. so far, the motors been stripped and cleaned up and the bottom end is back together and in the frame (thankfully the plain bearing main on the timing side wasnt worn out) and the gearbox is all ok give or take the odd scuff. frame is painted, ditto fork legs and swingarm and subframe. these are all now in one lump and will be added to by rear shocks and other odds and sods when i go in there later. i'll take more pics after and post an update. what i still need if anyone has any or any advice is; a petrol filler cap, and the generator looks ok but im not too sure if it actually is, so anyone with a set of windings would help! and a headlight . ive got the nacelle and the mounts, but the glass/lens is missing. anything else thats missing i will list when i find out. the plan is to go round his house on his birthday, and whilst he is out with his mrs(she is in on this) to somehow get the bike into his living room and then wrap it up in brown paper!!!!! she is sorting his insurance and then we will get an mot and tax it. another mate has got him an old pudding basin lid and some old gauntlets to complete the look. so, hopefully he will be able to ride it right away. i'll update this later on. what do you think my chances are. 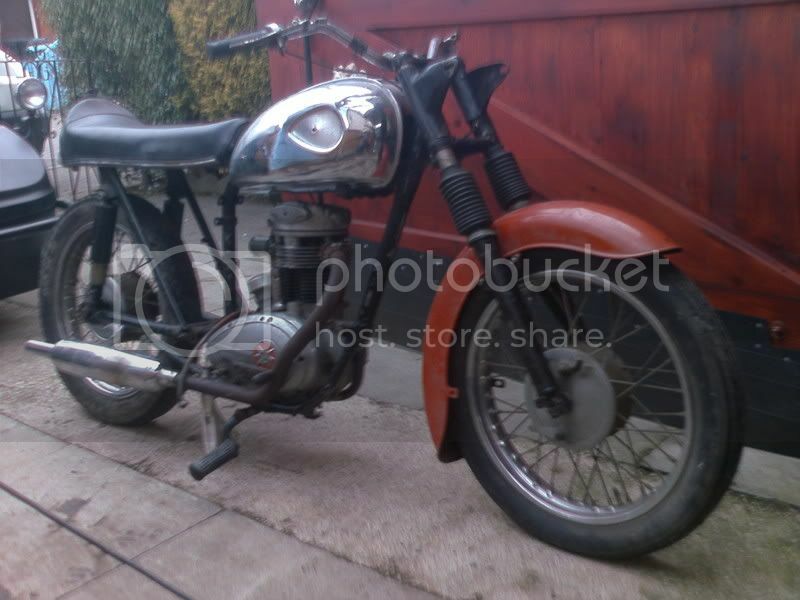 under 300 quid for a classic brit bike? and they recon that old bikes are an expensive hobby!!!!!! I reckon you've got a job on your hands ! It might, just about, be do-able - if you can find folks prepared to donate odds and sods that they've got lurking in their sheds. But you've still go some major parts missing, and as with many things, The devil is in the detail - are you planning on making all the myriad little brackets and spacers that you'll need ? Good Luck - I look forward to seeing the end result. Finally, I don't like to nag, but PLEASE, can you keep all photos down to 600x450 and 100Kb maximum ? If you want to show us larger pictures, why not use the Members Gallery ? When you come for that matchless, please peruse my bantam spares and see if anything will fit. If you need any machining done, give me a yell. Can't promise owt (e.g. I can't make a gearbox cog from unobtainium kryptonide), but I can have a go. nothing is missing. not shown in the pic are all the rest of the tinware, oil tank carb airbox, sidepanel toolbox, mudguard stays footpegs and pillion pegs kickstart gear lever, speedo etc, cables levers etc, they just werent on the bike when i took the pic. as i said, im suspect about the genny, and theres no filler cap but aside from a handfull of screws and nuts and bolts, it all appears to be there. and was a runner before being stripped to be restored by its previous owner(i know its last 3 owners ) because he cant abide anything thats not absolutely perfect, but he just lost interest when he got into big traily bikes. its just time and odd nuts and bolts that im going to be short of. "I roughly assembled the bits I've got, and this is what we have so far." Sounds like youve got a bit of a challenge going on there John! Ive just got (finally...) a Starfire with a B40 engine in it that's in bits . I'm sure there'll be a load of spare bits going once I have it in some sort of order (there's loads of stuff with it). I f I have anything that may be of use I'll let you know - I owe you a favour for looking at my 3ta last year. the sites gone gone gone C15 mad,go for it johnr i'm doing mine on less than ur, are at the moment anyway[3 day week]. i have a petrol cap if you want it, where are you? The Mighty Gusset wrote: Ah ! sorry, my mistake, i meant that the list of stuff i was going to post was what i'd got so far. I think I have a spare headlight unit and bulb holder you can have. I'll have a search for it at the weekend. frame is painted, ditto subframe and swingarm, smoothrite black. not perfect, but at least its rust free now. 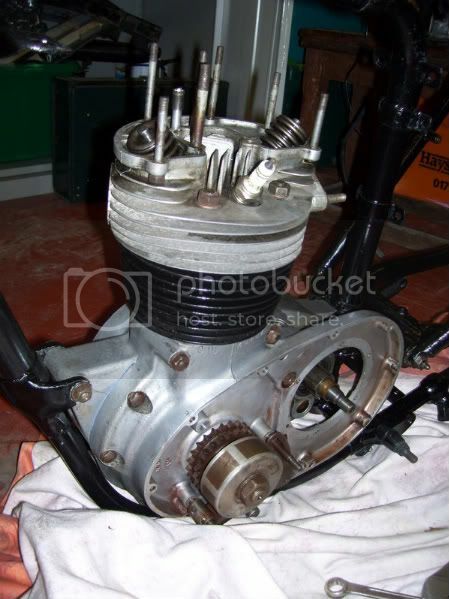 engine is stripped, cleaned and re assembled with new gaskets and bits where required. as im waiting for the timing side crank nut, ive not got the casings back on it yet, but when the bits come, i'll complete the motor, barrel is also smoothrite, and the rest of the motor is as it was, just with all the crud removed. as ive no headstock bearings yet, im mesing with the small braketry that came with it, prior to giving it a coat of primer. the shed is currelty laid out with bits of c15!! this is the motor, with its thick layer of greasy oily muck removed. almost presentable considering its older than i am. and these have arrived ready for me to fit, i just like the look of khaki green bikes with chunky block pattern tyres. and a snip at 20 quid each!! 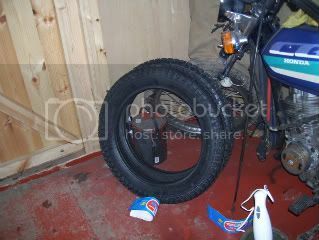 so today, im removing the old tyres and painting the rims. a coat of primer then satin black i think, as well as these im going for satin black on the shocks, sidestand and handlebars. not going to be anything shiney on this bike if i can help it! and grahame, thanks for the offer, the headlight has had me scratching my head a little. as i want to retain the nacelle with the speedo in it.